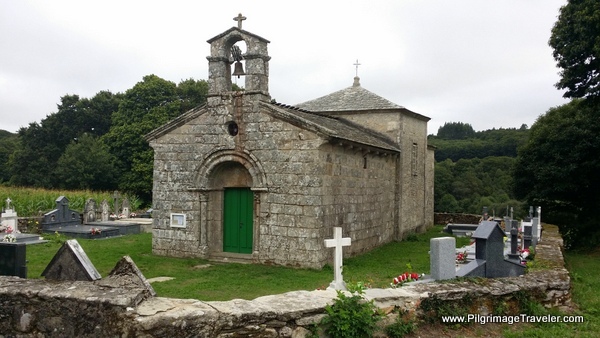 The churches of Monte Naranco are UNESCO World Heritage sites that I recommend for a visit prior to your walk to Santiago de Compostela. 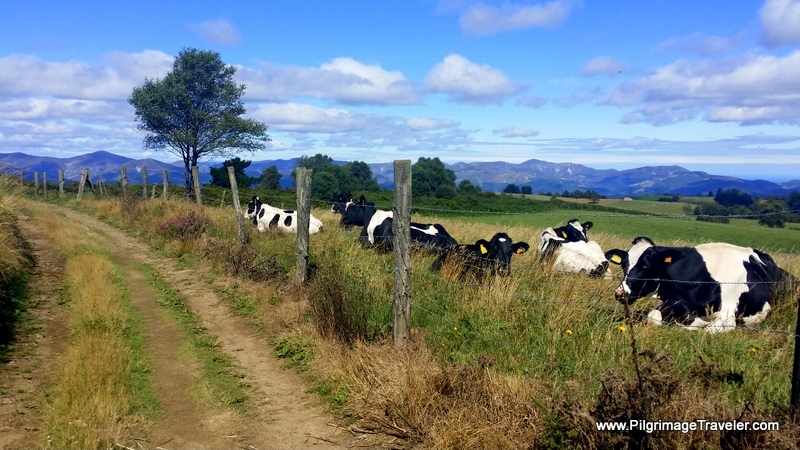 They are located in Oviedo, Spain at the start of the Camino Primitivo and just a few kilometers out of town. 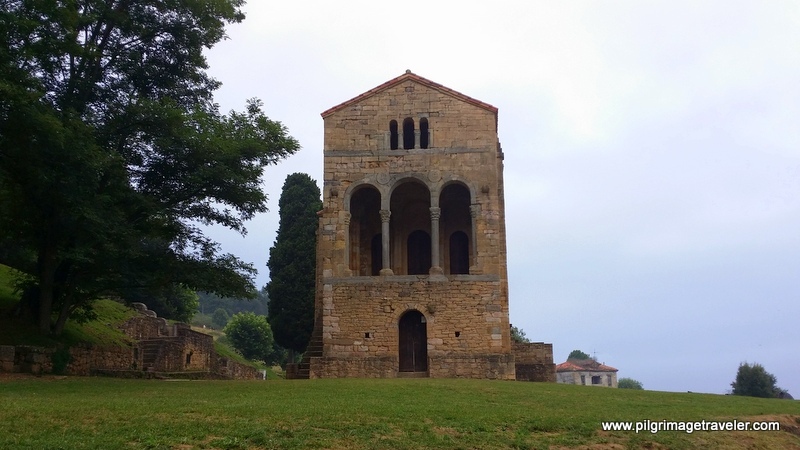 These sites are considered to be some of the most significant pre-Romanesque structures in Europe. 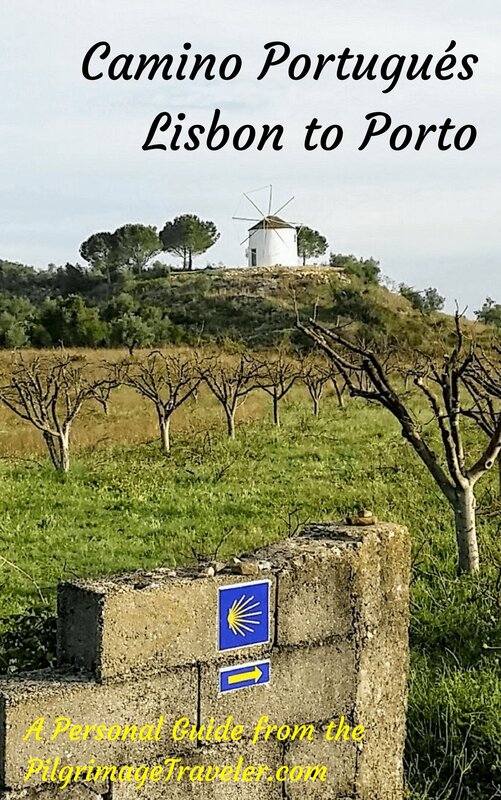 I love this quote, because it is so appropriate for the Camino Primitivo (the Original Way) and the city of world heritage churches, which is Oviedo, Spain. 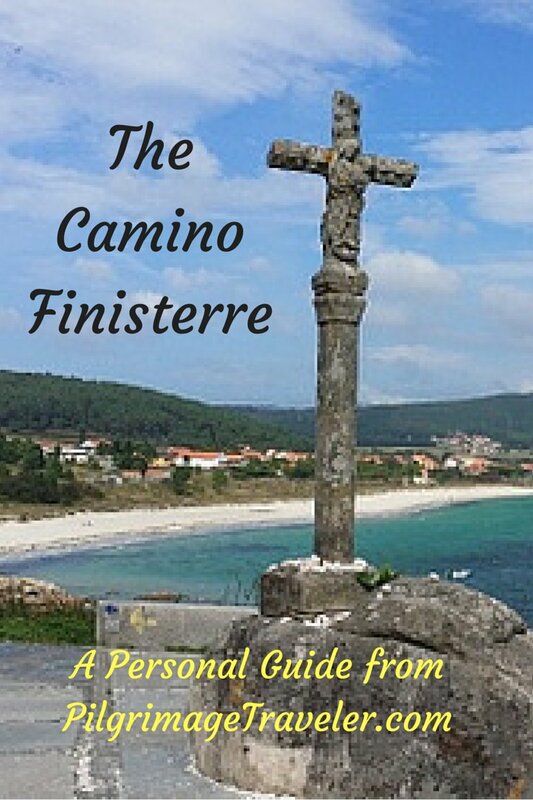 We used the excuse of the Naranco Churches to extend our Camino Primitivo, and walked up the mountain of Monte Naranco, first, before setting out for Santiago de Compostela. 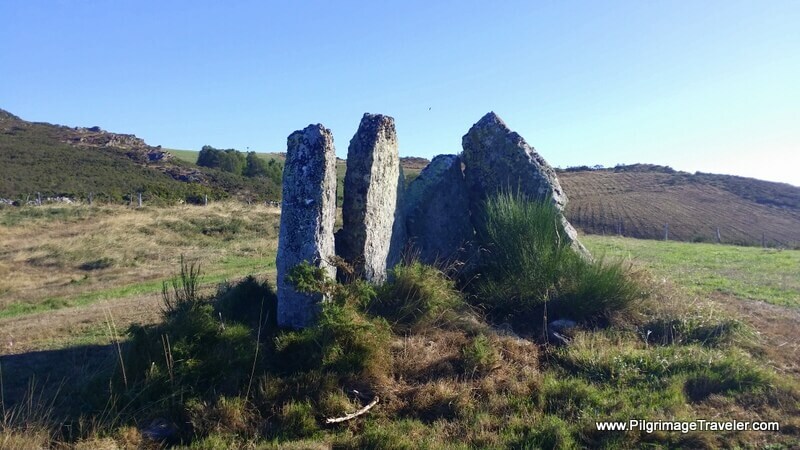 A visit to these sites are totally worth the extra 6.2 km and two or so hours to see them. 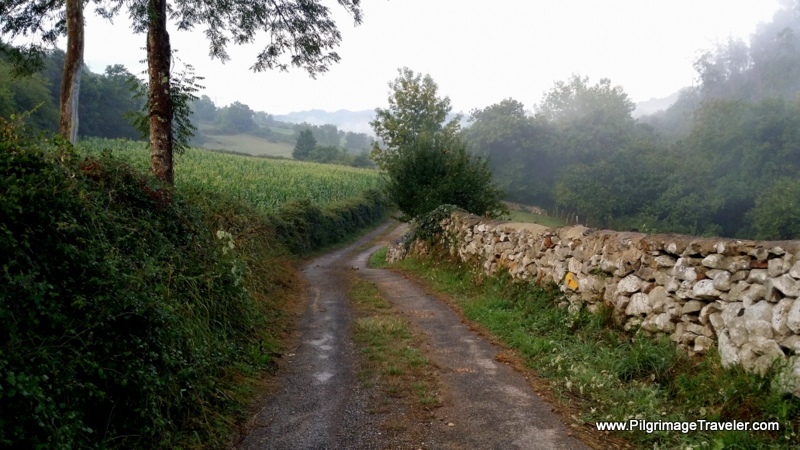 It was a lovely, misty morning when we left our hostal on Uría Street, right in the center of town. 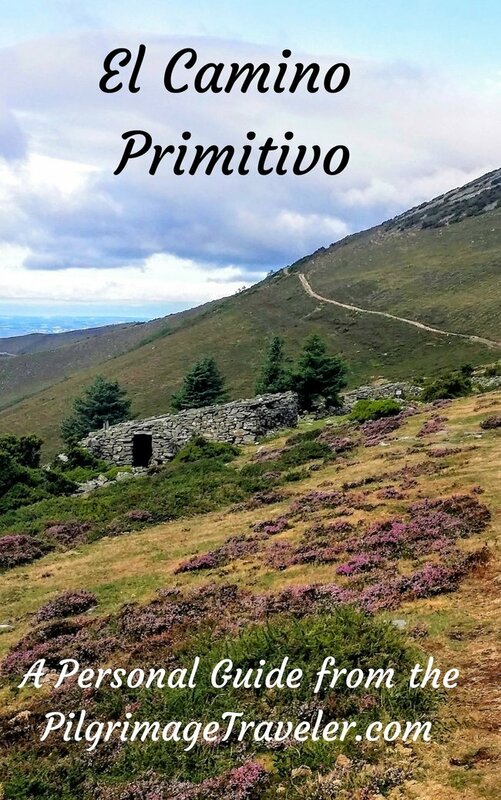 A visit to these old sites are not on the Camino Primitivo itself, so there are no waymarks or yellow arrows to follow. 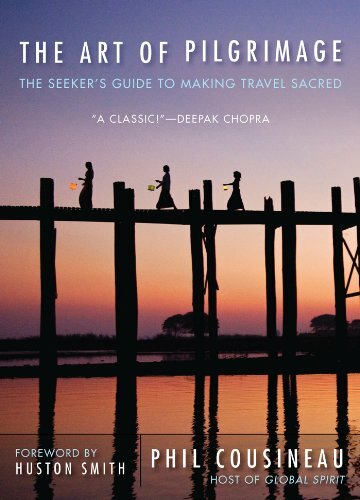 You must navigate yourself. Regardless of the point from which you chose to leave Oviedo, I have included a map of the city, below, to show you the walking route we took. 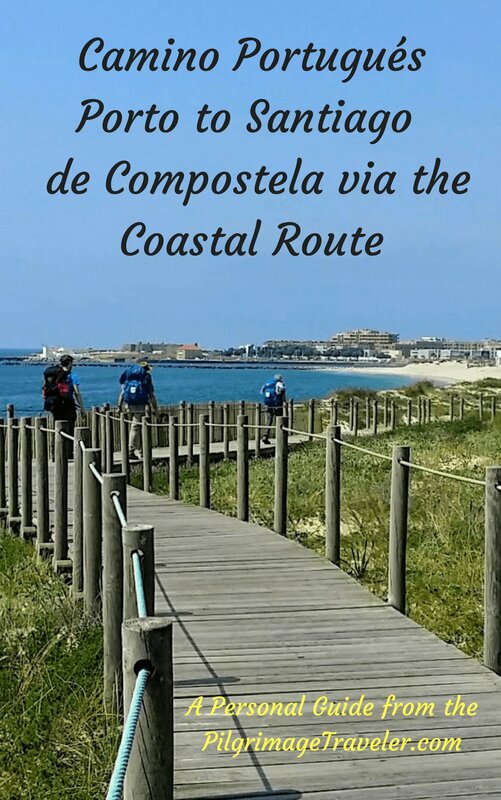 Hopefully, our route will help you plan yours. Play with the map, zoom in and out and move it around to get the full effect. It is totally interactive. 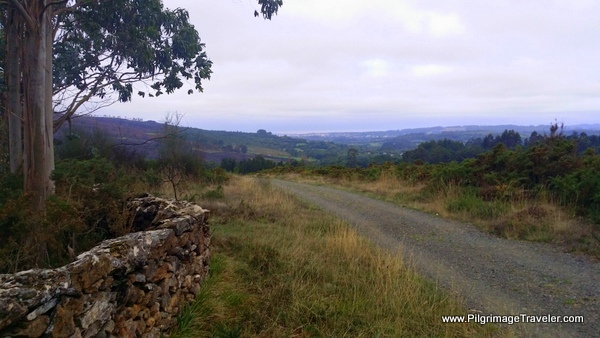 The route is relatively straightforward, mostly along the Avenida de Monomentos that climbs Mount Naranco. It only took us 45 minutes to walk the 3 km from the center of town to the first monument and 30 minutes to walk back down the hill. 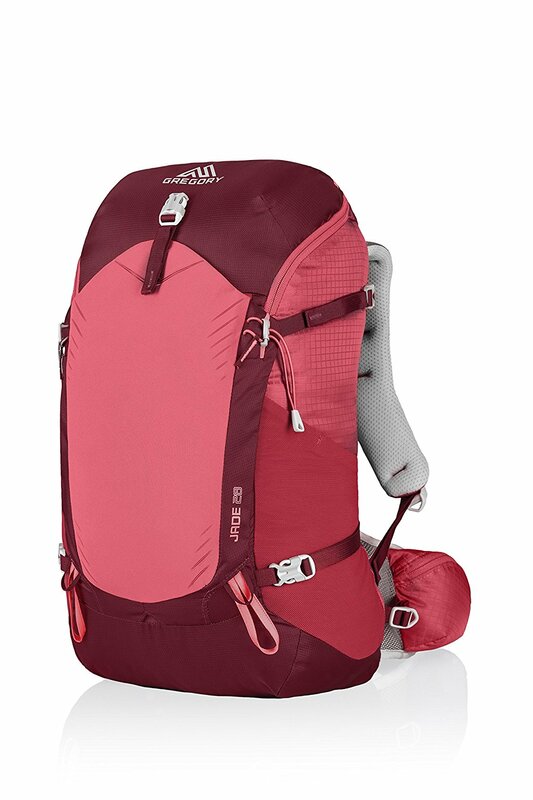 We chose to go back to the Original Way, instead of attempting the more direct short cut as described elsewhere. 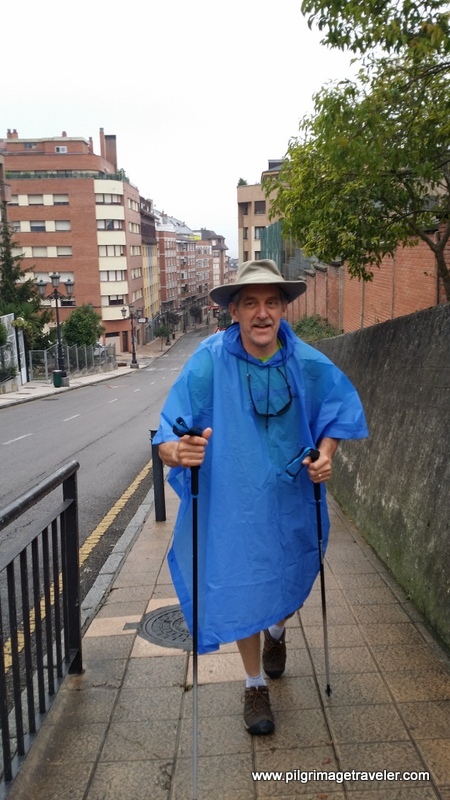 On our first official day on the Camino Primitivo, the weather threatened rain, and we were only on the road a few minutes when we took out our rain gear. 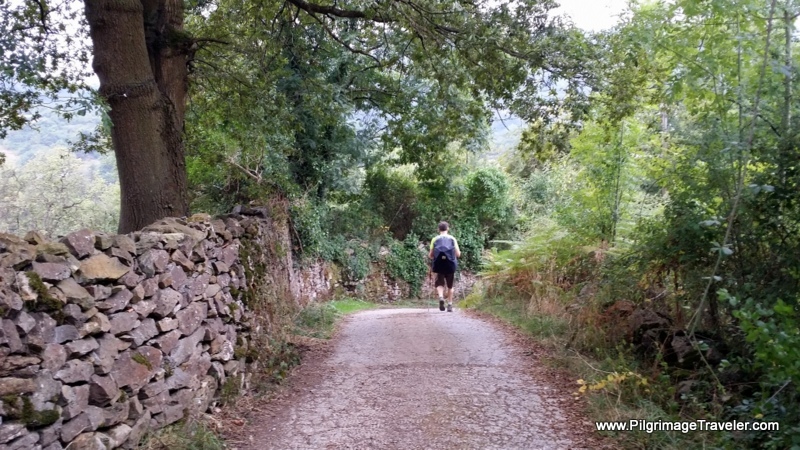 Here is my husband, Rich, walking up Calle Lorenzo Abruñedo, which we followed uphill quite a ways, soon after crossing under the railroad tracks by the train station. From this street, we turned left to briefly join the Calle Ing. Patac which shortly joins the Avenida de Monomentos (Avenue of Monuments). 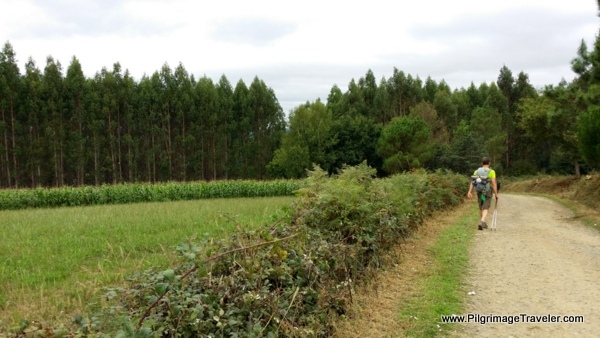 Essentially, from here, one just follows the road all the way to the Naranco Sites. 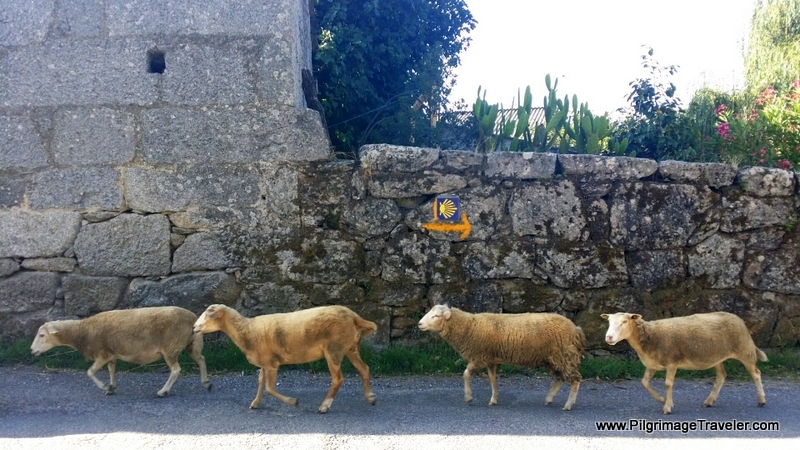 After joining the Avenida de Monomentos, in about a kilometer or so, we came to a prominent pedestrian crosswalk, with a paved single lane leading to the left. We knew that the main road led to the monuments, but this appeared to be a shortcut. We decided to take the narrow lane, and indeed, it turned out to be a shortcut. 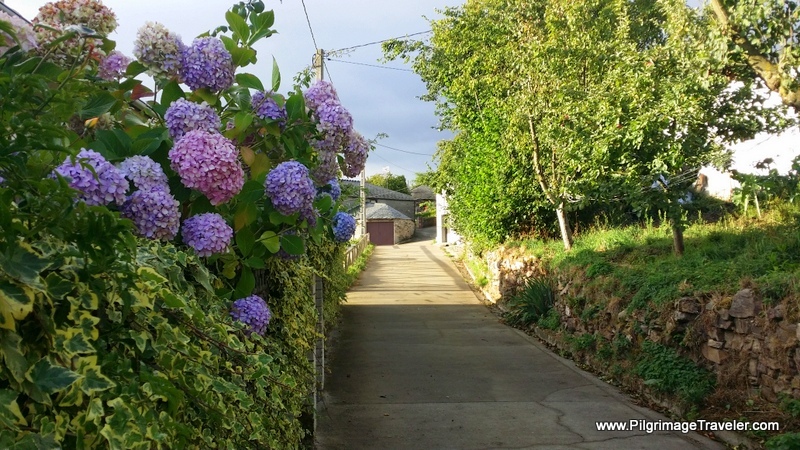 The lane was quiet, tree-lined and and led through some gorgeous properties, including the one below, with a very picturesque horreo (granary). 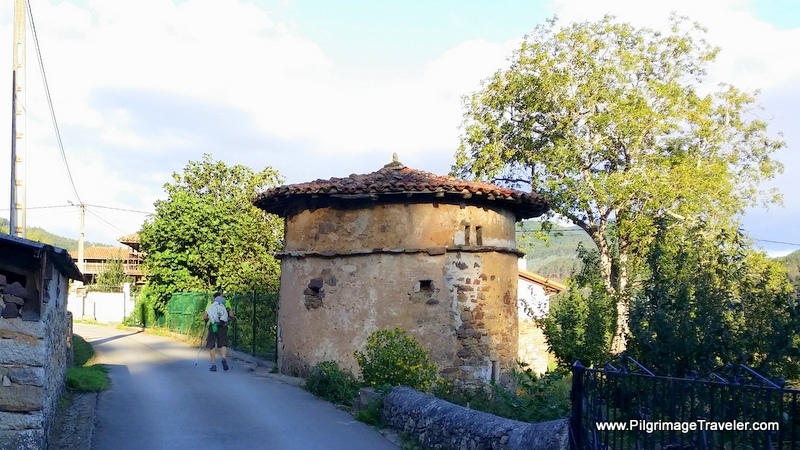 While the granaries in Galicia are rectangular, we soon learned that here in Asturias they are square, and therefore larger. The narrow lane also walks by the Interpretive Center for the Naranco Sites, but since we had gotten a very early start (7:30 a.m.), it was not open. 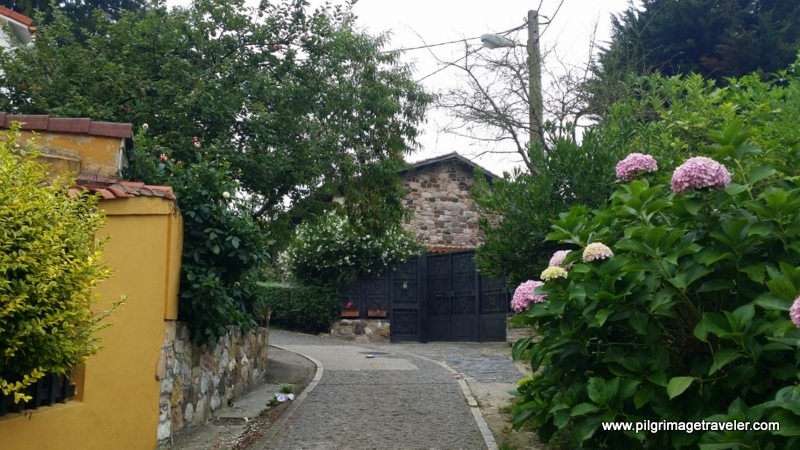 Just before the Santa María church, we walked by this lovely homestead, with gorgeous plants and flowers lining the road. 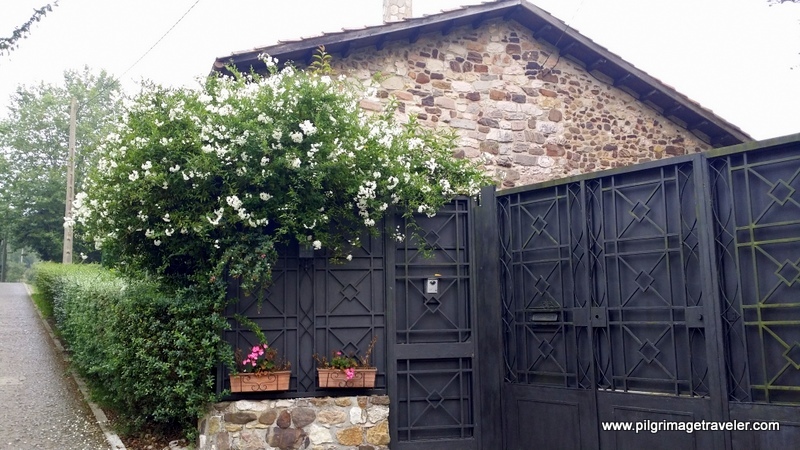 I just loved the flowering vines, the potted geraniums and the stonework of the building, when a I took a closer look. 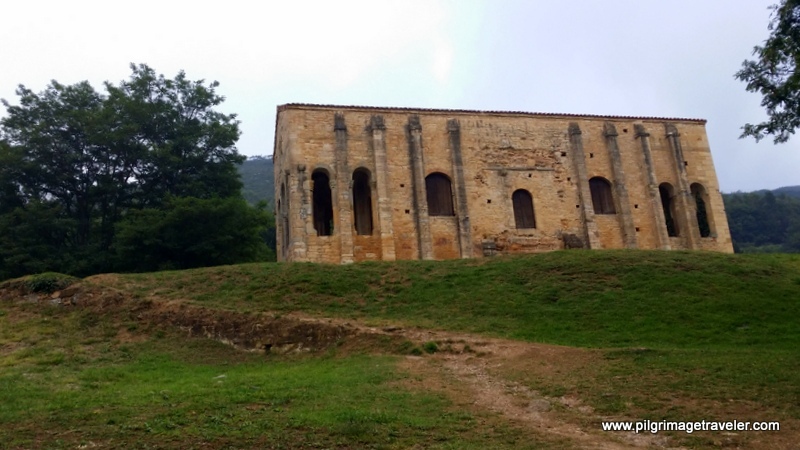 As we continued walking up the hill, past this homestead, all of a sudden looming up before us was the Santa María del Naranco Church, up higher on the hill to the north. You can see our first glimpse, in the photo below. 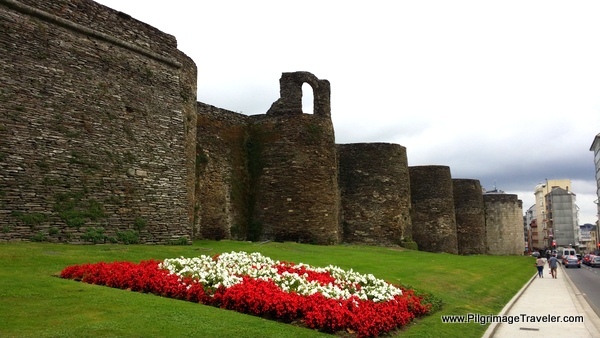 The building that you see was originally built as a two-storied palace for King Ramiro I in 848 C.E. 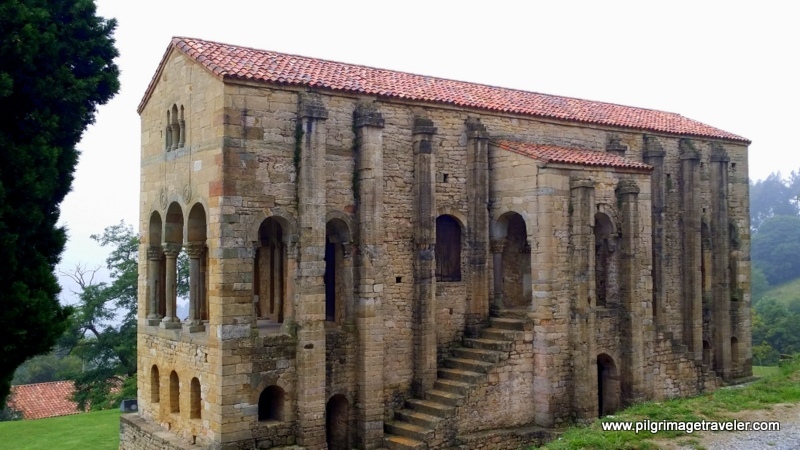 The palace was part of a larger complex that included the San Miguel de Lillo church. According to the World Heritage Site webpage, the palace was converted into a parish church, sometime between 905 and 1065. As we climbed the hill to the West, this view could be seen, of the main entryway. Getting closer to the building, a side stairway quickly comes into view. Since we arrived here at this site at approximately 8:30 a.m., the building was closed until 9:30. We climbed the stairway, of course, but there were no windows to peer into, unfortunately! 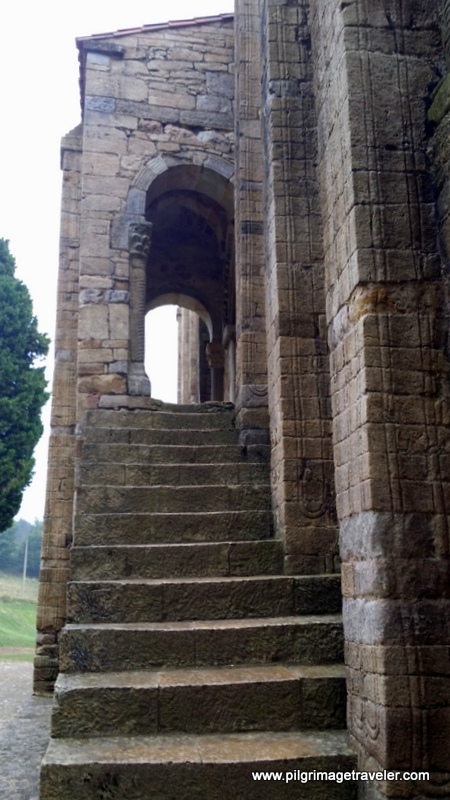 According to the Asturias Tourism website on ﻿Santa María del Naranco﻿, this stairway is the only access to the upper story. 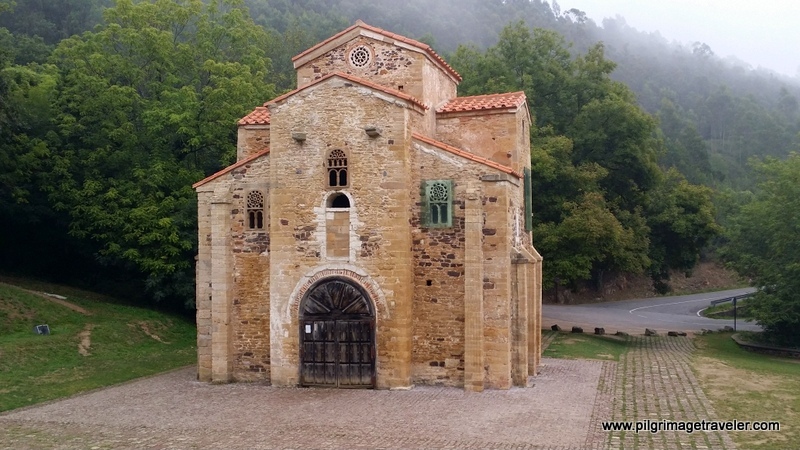 The lower story is entirely contained within itself and is a crypt-like structure, similar to the original 9th century church in Oviedo, within the grand Cathedral itself, called the Crypt of Santa Leocadia. 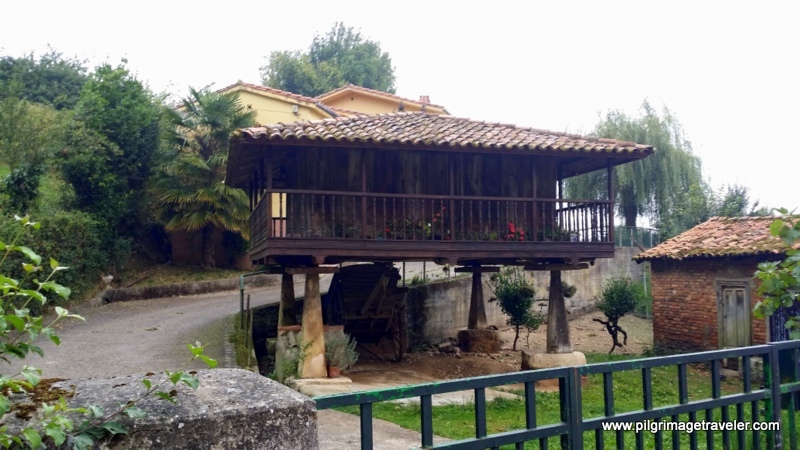 The upper story, is a single room with balconies on both sides, that you can clearly see from the outside. Walking around the back of the Naranco Church, the large open balcony appeared to contain an altar. I was able to verify this later, that indeed, this was an altar. It bears an inscription dated 23 June 848, noting, in Latin, its consecration. This is the northern view from the Avenida de Monomentos, which winds around to the north of the building. 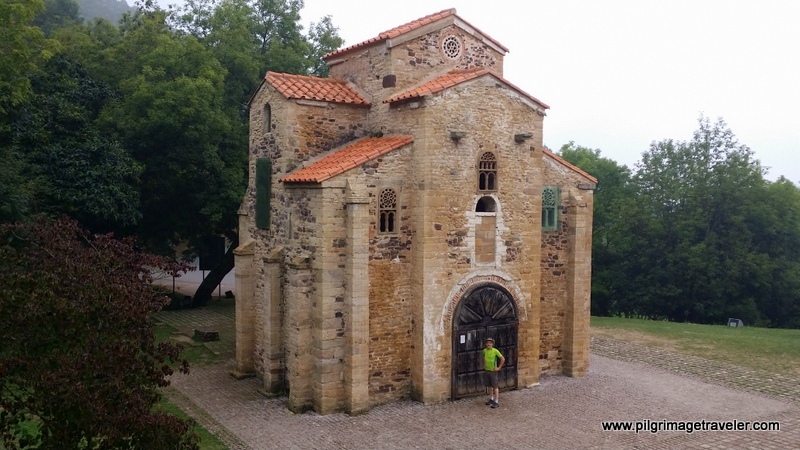 While waiting for the Santa María Church to open, we decided to stroll the additional 100 yards up the road to the San Miguel de Lillo Church, the 2nd of the Naranco sites. The mist was more apparent here, and added to the mystique of the place. As far as we could tell, this church was not going to open that day. 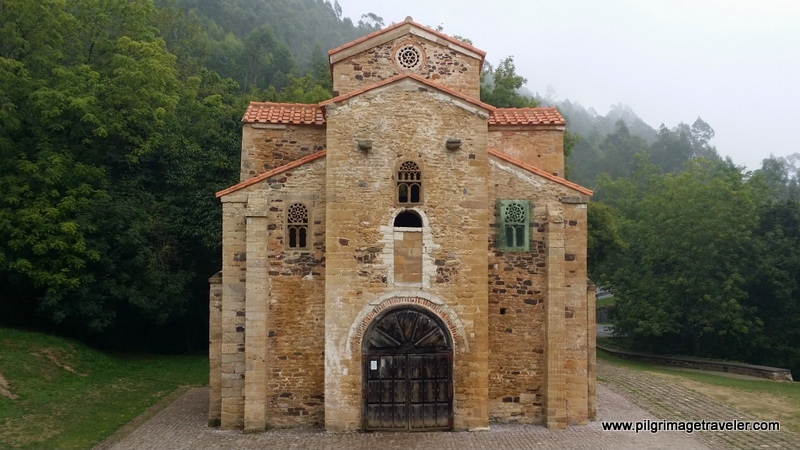 According to the Asturias Tourism site on San Miguel de Lillo, the opening hours are similar to the Santa María church, but we could find nothing posted indicating this. We hung out by the San Miguel de Lillo church, taking in the ambiance and waiting for the Santa María to open. Apparently only one third of this church is original, due to a collapse in the structure sometime during the 12th or 13th century. The church was originally built on the basilica plan, with three aisles and a barrel vault. I really wished I could have seen inside it! One last look at the Church before heading back down the way we came. 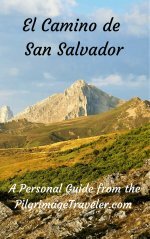 When we returned to the Santa María del Naranco Church by 9:30, it was open. However, they were not accepting any entrance without a tour which was in Spanish, and it was not due to begin until 10:00 a.m. Plus it cost 13 Euros. We decided, with reluctance, that we need to continue on our pilgrimage, to arrive at the first municipal albergue by mid-afternoon. We were unable to see inside either monument! And so it was. 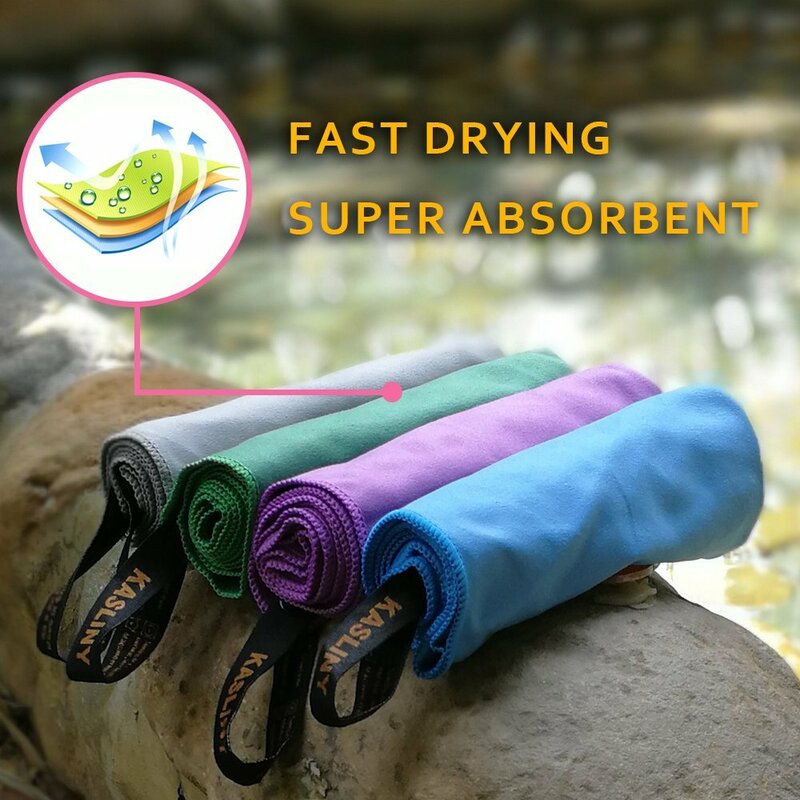 This also shall we include! 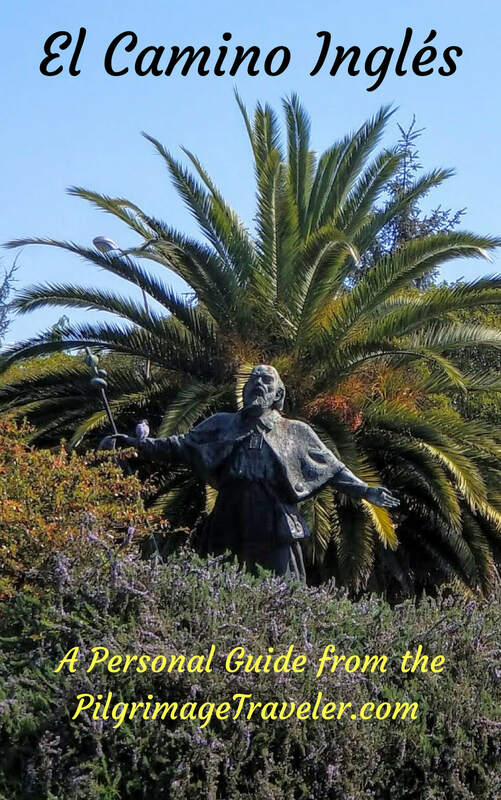 Had we continued on to the top of the mountain, there is a great statue, the Monument to the Sacred Heart, or Monumento al Sagrado Corazón de Jesús. The views of Oviedo and the mountains look spectacular from here. More reasons to return to this place! 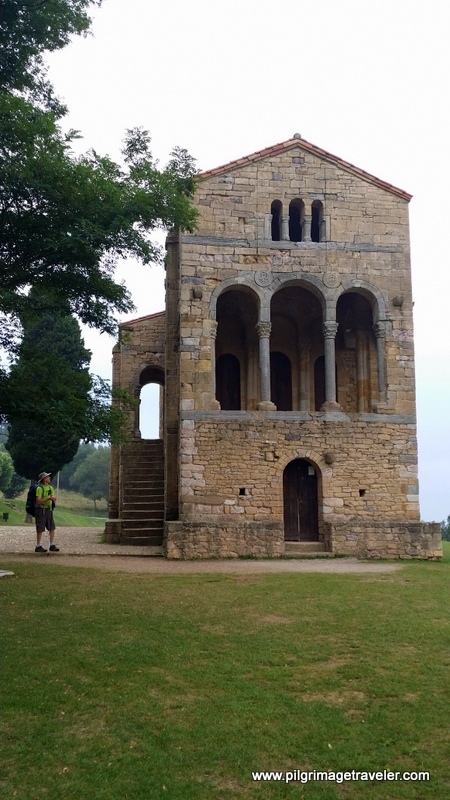 We did actually see four of the five UNESCO world heritage sites in Oviedo, the San Julián de los Prados, the Cámara Santa in the cathedral of Oviedo, Santa María del Naranco and San Miguel de Lillo. 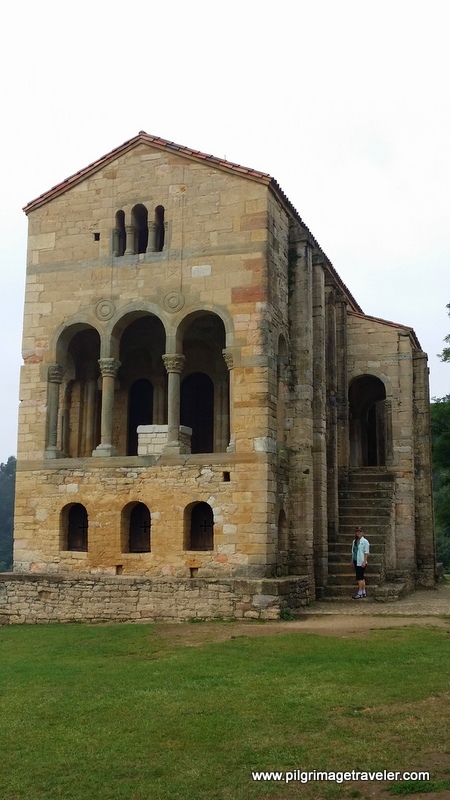 The fifth site is the Iglesia de Santa Cristina de Lena - due south of Oviedo outside of the city if you are interested in seeing them all. 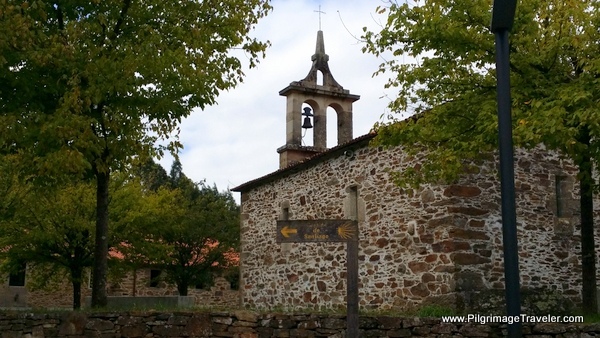 This church is along the route of the Camino San Salvador, our fifth day. Click on this link to see photos of it. 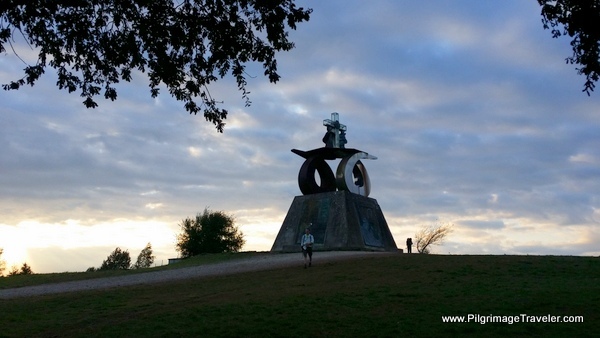 I hope you enjoyed your brief introduction to the sites at Monte Naranco. 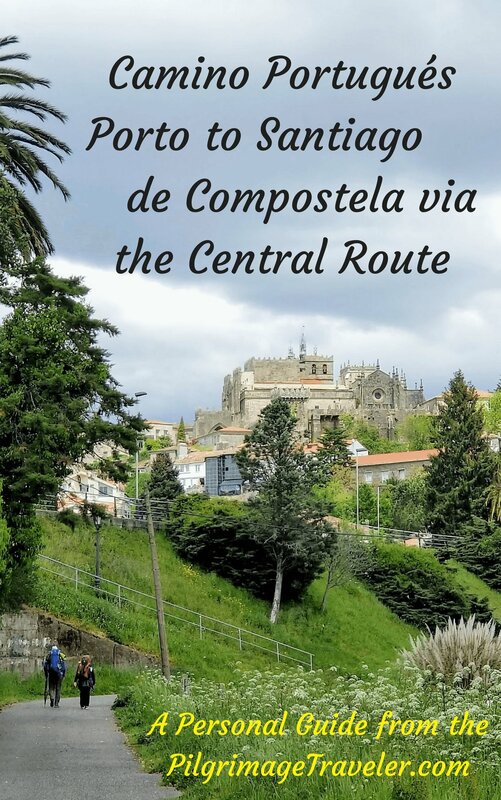 Hopefully, I have helped you make your decision whether or not to include these sites into your own pilgrimage travel to Santiago de Compostela! 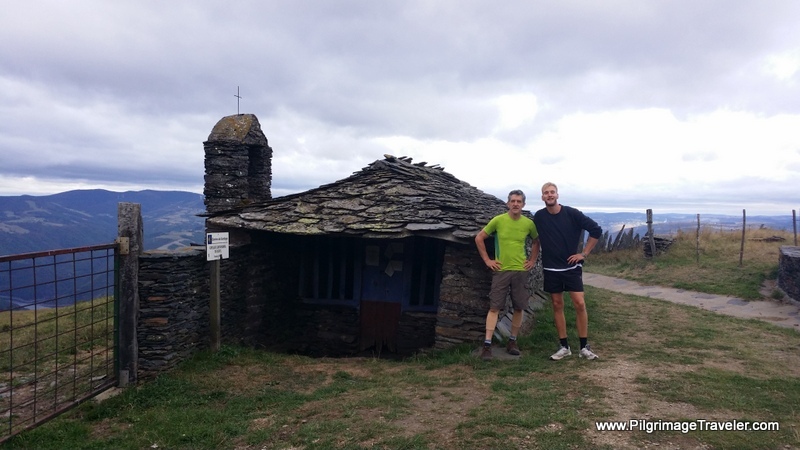 I hope you continue to follow us on our journey from Oviedo to Esclampero, Spain, on our first stage of the Camino Primitivo as pilgrimage travelers. 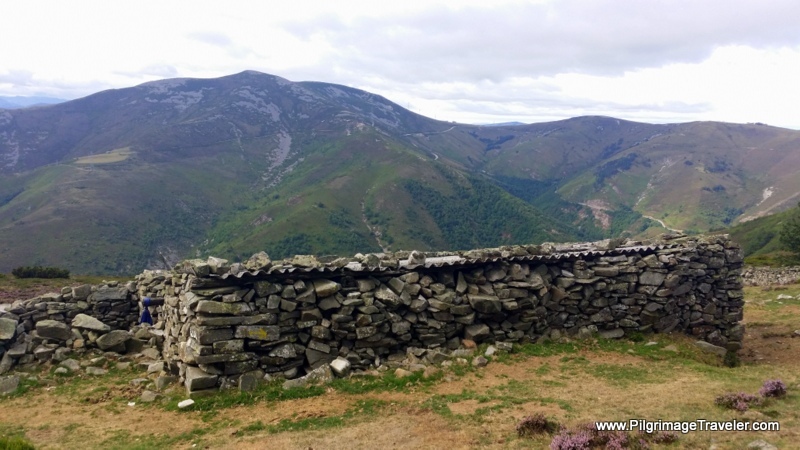 As Jeremiah says, may you "ask for the ancient paths, where the good way is; and walk in it, and find rest for your souls," for there is nothing older on the Camino than these World Heritage sites that include Monte Naranco!